The question that always comes to mind when I arrive back in Japan. What am I going to eat first? Like a kid in a candy store, my mind starts racing away; sushi, tonkatsu, Japanese curry, ramen, tempura…and so it goes on. The decision is more difficult as I’m in Osaka. For quality, choice, and value, Osaka is an excellent place to sample the best of Japanese and local food. Known as the ‘nations kitchen’ (tenka no daidokoro), Osaka rivals Tokyo as Japan’s food capital. Trust me. A food tour of Osaka with a knowledgeable guide would be one of your most memorable experiences in Japan. I opted for kaitenzushi – known outside of Japan as conveyor belt sushi or sushi train – a fine first choice. Conveyor belt sushi is a fun way to eat and easy. Ideal for someone who can’t read Japanese and is jet-lagged from a 12-hour flight. Even the cheapest sushi in Osaka tastes great and excellent value. The plates on the conveyor belt gave me inspiration, but I prefer to order fresh made. I flicked through the picture menu picking out some favourite nigiri and maki sushi. ‘Kore, kore, kore, kore, kore..kudasai’. Even my basic spoken Japanese can manage to order at kaitenzushi ‘this, this, this, this, this..thank you’. Within a few minutes, the dishes started to arrive. I love mackerel whether it’s raw, cooked or smoked. It’s always delicious no matter how it’s served. Mackerel spoils quick, so it’s cured in salt and washed in rice vinegar before eaten. This preparation gives it the name shime saba or cured mackerel. I ate it with lashings of wasabi and a light dip of soy sauce. Oishi! I enjoy eating octopus in Japan more and more, but this was not always the case. It took me a while to get used to the chewy texture. One of my favourite food experiences to date in Japan was octopus tempura in Niigata. It was so tender and fresh. I went back to the izakaya the next day and ordered it straight away. Washed with salt the octopus is then beaten, poached and thinly sliced before served as sushi. Oishi! The specials menu had combinations of nigiri. Immediately my eyes gravitated to the medley of eel, shrimp and scallop. Eel is always cooked when eaten as sushi and finished with a delicious eel sauce (unagi no tare). Lightly grilling the shrimp and scallop increased the sweet flavours. I ate the medley of sushi slowly to enjoy each delicious and unique taste. Oishi! I’d never eaten eel unagi style eel until I came to Japan. The classic London style jellied eel never appealed, if you’ve seen it you’ll know what I mean. Eel and cucumber maki is known as unakyu in Japan. The cucumber is a great compliment to the sweet tasting eel. Oishi! I was surprised to see the salmon, onion and mayonnaise nigiri on the menu. The combination seemed more like the fussy sushi you’d get outside of Japan. The onion was subtle and didn’t overpower the salmon. Oishi! A staple and long time favourite of mine is tuna maki. Like many non-Japanese people, this was one of my earliest sushi dishes. My sushi love affair started here. I’m a big fan of maki rolls as I’m a big fan of nori (seaweed). With a generous dollop of wasabi and soy sauce, the tuna maki did not last long. Oishi! Panko is a Japanese-style breadcrumb which adds a crunchy coating to fried foods. 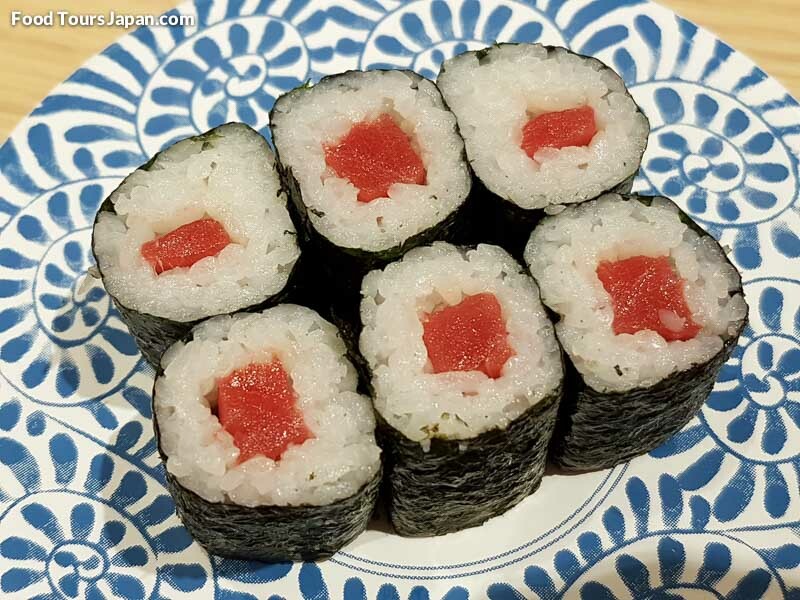 Futomaki translates into English as ‘fat rolled sushi’. It tasted delicious and was a filling sushi dish to end on. Oishi! I always finish a meal of sashimi or sushi with miso soup. Clam miso is a classic Japanese dish which always delivers. The tender clams added a tasty twist to the soup. Oishi! I always eat sushi or sashimi as my first meal when I arrive in Japan. Despite all the fabulous and varied food in Japan, it’s always this way. For the ultimate sushi experience in Japan, you have to go to Tokyo’s Tsukiji Market. You can easily spend a day there (I spent three! ), as there’s so much to see and do, and of course, eat. If you have little time, it’s well worth taking a Tsukiji Market tour. That’s it for now. I’m off to think about my second meal I’ll have in Japan. Let me know what your first meal was in Japan. I bet plenty of you had sushi. Oishi!